On a recent morning I sat down with two of the vampires from "Breaking Dawn Part 2" Maggie Grace (Irina) and Mia Maestro (Carmen). The Happygirl: Let's talk about the flash mob on the set. Mia Maestro: (laughs) Right. "Sweet Dreams are Made of This. " It was our go-to karaoke song that we would sing every Wednesday in Baton Rouge. After being there for 6 weeks working against a green screen morale was low. I knocked on everyone's trailers. I decided we needed a dance off with the Volturi. Some people were immediately on board and some were not. We did choreography. Then when Bill (Condon, director) said "Action" "Sweet Dreams Are Made of This" started playing instead. The Happygirl: What was Bill's reaction to this? Maggie Grace: Well, it was just grueling. The most exciting scene in the world if you repeat it over and over and over again many times a day for six weeks can get repetitive . . This was really everyone's favorite scene to see because it was just magnificent. The Happygirl: Which scene was it? 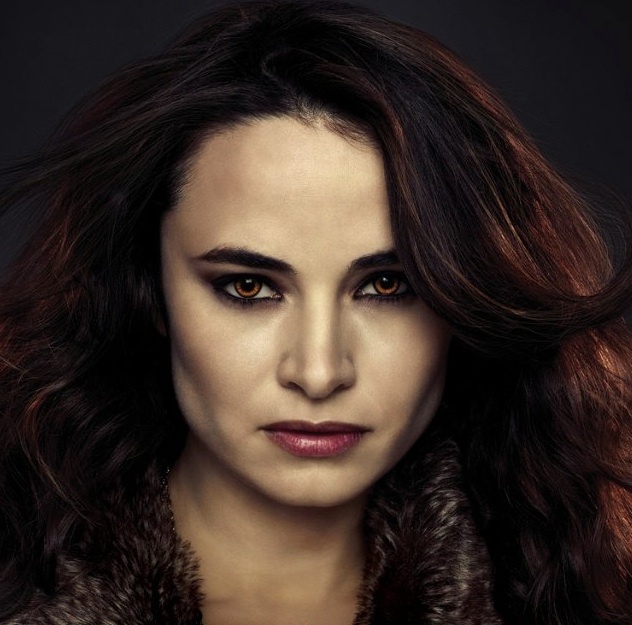 Mia Maestro: It was the final scene between the Volturi and the Cullens and other vampires. The battle of all battles. Mia Maestro:You know the whole dance off scene actually happened because my character has no special powers whatsoever. The book says my character is very motherly and warm. Lee Pace who plays Garrett used to joke that Carmen has the power of dance and she will kill the Volturi by the power of dancing. She will make everyone dance. That was the seed of the flash mob, dance off. The Happygirl: That would be a whole other movie, wouldn't it? "Dancing with the Coven" rather than "Dancing With the Stars"? Maggie Grace: I don't have the rights but I think it would be a great musical. The Happygirl: One of the more interesting places I find onset is craft services. I imagine on your set you would have the vampires and werewolves wandering around in full makeup and costumes. Maggie Grace: You mean like the awkward high school cafeteria moment where I'm like "Oh my God, do I put my tray down with my coven or do I set down with the werewolves? " The Happygirl: What was your favorite moment on set? Happiest moment? Maggie Grace: There was one moment when we were off trying to go cross country skiing and Mia's dog River was with us bouncing around. It started snowing for the first time and it all came together. It was like the perfect moment for me. I thought "I am really lucky to be here right now." Mia Maestro: British Columbia was so beautiful. I just loved it there so much. Lee Pace and I would go hiking. I have this amazing memory of one of the days we were filming in Squamish and there was an issue with rain and we were all staying at this hotel and there was this schedule problem that Bill and everyone were all working on but Lee and I come in from Cross County skiing for like five hours and then the Four Seasons for martinis and hamburgers and then soaking in hot and cold and we got to the restaurant in our skiing gear and we were looking all happy and everyone was like "Ugh!" The Happygirl: What was the last day on the set like for you? Mia Maestro: It was kind of crazy remember? (to Maggie) It was the wedding scene from Part 1. We were shooting all night. It was stressful because it had been raining. Maggie Grace: There was mud to our knees. Mia Maestro: It was emotional for people who had been working on the film for all these years. The Happygirl: The wedding scene was so beautiful. Did you feel that crackle in the air? Mia Maestro: It felt like a real wedding. No one had seen the dress. I loved shooting in the woods. There was the most beautiful river streaming by. It was beautiful. The Happygirl: If you have any kids in your life I imagine taking this role made you very popular. The Happygirl: We see Kristen's character (Bella) change dramatically from "Breaking Dawn Part 1" to Part 2. Did you see a change in Kristen? Maggie Grace: Yeah, you really see her strength in the film from girl to woman. I think she carries herself quite differently as well. Mia Maestro: It's quite seldom to see a woman's arc through five films. The Happygirl: We've also heard that Kristen and Rob (Pattinson) were very nurturing towards their onscreen daughter Renesmee. Mia Maestro: Mackenzie Foy was the best child to work with. Her mom was wonderful. Myself or Lee Pace would go and have cocoa with her. She was a great kid to hang out with. She has very special energy. She is sort of magical in her own personality. So, it was natural for Rob and Kristen to gravitate towards her and be so loving towards her. The Happygirl: What was you main reason for wanting to take these roles? Maggie Grace: Bill Condon. Plus, it was so much to be part of something that means so much to an entire generation. 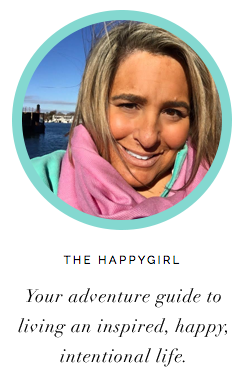 The Happygirl: What's your happy place? Mia Maestro: The ocean. Right now, Hawaii. I go there with my boyfriend a lot. Maggie Grace: Right now I feel like I have a really amazing day if I get to spend time in the garden I planted last year. Even if it's just for a couple of minutes if I can start my day there it's a great day, a happy day. Mia Maestro: I would say slow roasted organic lamb. That's my happy food especially because it's winter time. Maggie Grace: I am a tea fanatic. The Happygirl: What's your happy way to start your morning? Mia Maestro: I know Maggie's! Tea!! Maggie Grace: Poetry is like prayer early in the morning. I am too much of an admirer of poetry to start writing it. Mia Maestro: I like to start my day surfing. The Happygirl: What word makes you happy? Mia Maestro: AMAZING. I say it a lot. Maggie Grace: She does say it a lot! (laughs) It's AMAAAAZZZZING! 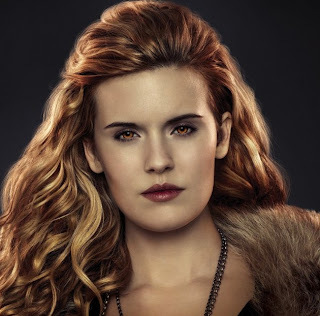 Maggie Grace: My word? Kiss. That is my word. Kiss.